John McCain in Merrimack, NH. 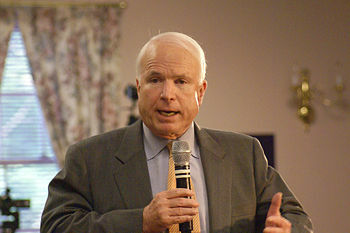 John McCain (born John Sidney McCain III, on August 29, 1936), Republican Senator from Arizona (1986- present), was the nominee for the Republican presidential nomination in 2008. Following primary election victories on March 4, McCain secured enough support to take the nomination at September's Republican National Convention. He faced Barack Obama, a Democratic Senator from Illinois, and lost to him in the general election of November 4, 2008. McCain first sought the Republican presidential nomination in 2000 and defeated George W. Bush in the New Hampshire and other primaries, but Bush came back to easily win the nomination, and then went on to win the very close election. McCain stands for civic duty and traditional conservative positions, especially regarding lower spending, lower taxes, opposition to abortion, and a strong foreign policy. Some conservatives complain about his longtime advocacy of campaign finance reforms that would weaken the power of special interest groups, saying they violate the First Amendment freedom of speech. Other conservatives object to his opposition to Bush's tax cuts in 2001, although McCain now supports their renewal. On March 5, Bush endorsed McCain's candidature. A former Navy flier who was shot down in the Vietnam War and spent over five years as a prisoner of war in Hanoi, McCain has been a prominent voice on military and foreign affairs. He is especially outspoken in demanding forceful action in the Iraq war, and claims credit for the "surge" underway in 2007-8 under General David Petraeus. McCain was the frontrunner for the 2008 presidential nomination according to the polls when his campaign imploded in summer 2007. He had spent all his money, direction was lacking, his staff was in turmoil, and most had to be terminated. McCain's standing fell sharply in the polls because of the unpopularity of his hardline Iraq position and his proposed bill (in cooperation with Bush and Democratic Senator Ted Kennedy) that would open a path to citizenship for illegal immigrants. Commentators wrote his obituary. But McCain fought back, using his drastically reduced funds to concentrate on a highly personal town-by-town "retail politics" campaign in the first primary state, New Hampshire. His main opponent Mitt Romney lost in the Iowa caucuses in early January, 2008, giving McCain momentum in New Hampshire. As supporters chanted "Mac is Back!" he defeated Romney 37%-32%, with Mike Huckabee trailing at 11%. In August 2008 he selected Sarah Palin, the governor of Alaska, as his vice-presidential running mate. McCain was born in the Panama Canal Zone (then part of the U.S.), where his father was stationed in the Navy. His grandfather John S. McCain, Sr. was a three-star admiral in charge of naval aviation at the battle of Okinawa in 1945. His father John S. McCain, Jr., was a four-star admiral who headed the Pacific Command, with overall responsibility for the Vietnam War, at a time when his son was prisoner. The McCain family is primarily of Scots-Irish and English ancestry. Great-great-uncle Major General Henry P. McCain was the father of the selective service system in World War I, and was Adjutant General of the Army in 1914. Great-uncle Brigadier General William A. McCain earned Distinguished Service Crosses in both world wars. Great-grandfather John McCain served as sheriff in his home county in Mississsippi for six years. McCain was married to Carol Shepp from 1965 until 1980; they had one daughter, Sidney (1966), and divorced in 1980. McCain married Cindy Hensley (May 17, 1980 - present). Her father was a wealthy beer distributor in Phoenix, and she now owns the company, and has a reported wealth over $100 million. Their children are Bridget, 1991 (adopted from Bangladesh, 1992); Jimmy, 1988; Jack, 1986; Meghan, 1984. His adopted sons from Carol's previous marriage are Andy, 1962, and Doug, 1959. His is a member of the Episcopalian church. McCain was a graduate of the U.S. Naval Academy at Annapolis (1958, B.S. in engineering), where his multiple demerits put him near the bottom. He attended the prestigious National War College (1973-74). While waiting to take off on a combat mission from from the aircraft carrier USS Forrestal, his aircraft was hit by a rocket accidentally fired by another aircraft on the deck, putting him at the center of a catastrophic fire. During Lt. Commander McCain's 23rd bombing mission on October 26, 1967, a Soviet-built missile struck his A-4 Skyhawk fighter-bomber and forced him to eject, knocking him unconscious and breaking both his arms and a leg. As a prisoner of war at the "Hanoi Hilton", he was denied necessary medical treatment and often beaten by the North Vietnamese. He still has a limp and disabilities in the arms. Once the Vietnamese discovered his father's identity they offered to release him, but he refused and was finally freed in January, 1973, with all the other American prisoners. McCain returned to the U.S. in 1973 and after the National War College was assigned a command in naval aviation, 1974-77. He was transferred to Washington, D.C. where he was promoted to captain and was a Navy lobbyist on Capitol Hill, 1977-80. Reporting to him as Marine Corps liaision was James Jones, likely Assistant to the President for National Security Affairs in the Obama Administration. McCain describes Jones as a close friend. He retired from the Navy in 1980 and moved to Arizona. He was elected to the U.S. House in 1982 from Phoenix, and then to the U.S. Senate in 1986, as a Republican. He was reelected in 1992, 1998, and 2004, and rose to chair the Armed Services Committee when the GOP was in power; since the Democrats took control of the Senate after the 2006 elections, he is now the ranking minority member. He sits on all subcommittees. He also has chaired the Indian Affairs committee (1995-97 and 2005-6), which broke the scandals tied to Republican lobbyist Jack Abramoff. He was defeated by George W. Bush for the GOP presidential nomination in 2000, after winning the New Hampshire primary by 18 points, and losing an extraordinarily bitter contest in South Carolina. By 2004 he had become so popular among Democrats that Democratic presidential nominee John Kerry offered him the nomination for vice president, which he declined. McCain announced his candidacy Nov. 16, 2006, and immediately leaped into first place in the polls. He gained the Republican nomination, but for the most of the time trailed Democrat Barack Obama and eventually lost to him in the general election. The election was seen as a decisive loss to the Republican Party, as McCain failed to pick up traditionally Republican states such as Indiana, Virginia, and North Carolina. During the 2008 financial crisis, McCain and Obama clashed over the proposed taxpayer-baked Wall Street bailout; while McCain said he would suspend his campaign to go to Washington for talks over the deal, Obama argued that the forthcoming presidential debate should continue. In the event, Obama did go to Washington, but according to some commentators, was the more effective of the two men in raising pertinent issues. According to an anonymous Republican source, McCain was "the least creative person in the room at the President's White House meeting. He simply had no ideas. He didn't even have any good questions." ↑ CNN: 'Bush says he wants McCain to win presidency'. March 5 2008. This page was last modified 15:28, 10 February 2011.